I don't know about you, but I'm a bit of a sample hoarder. It defies logic; you can't possibly form a full opinion of a product from a sample (or even a few samples) yet I continue to purchase them, hunt for that last item to take my order to the "get more free samples!" price bracket, and pour over my sample selections in a fit of indecision. Then I never use them. What is wrong with me? They sit and collect dust. Granted, since I live in the desert, dust collects pretty quickly, but it's still not a good sign. So I am determined to make this work for me; I will work through my mountain of samples and review them in between my regular, long-term testing reviews. Two birds, one stone. Let's do this! 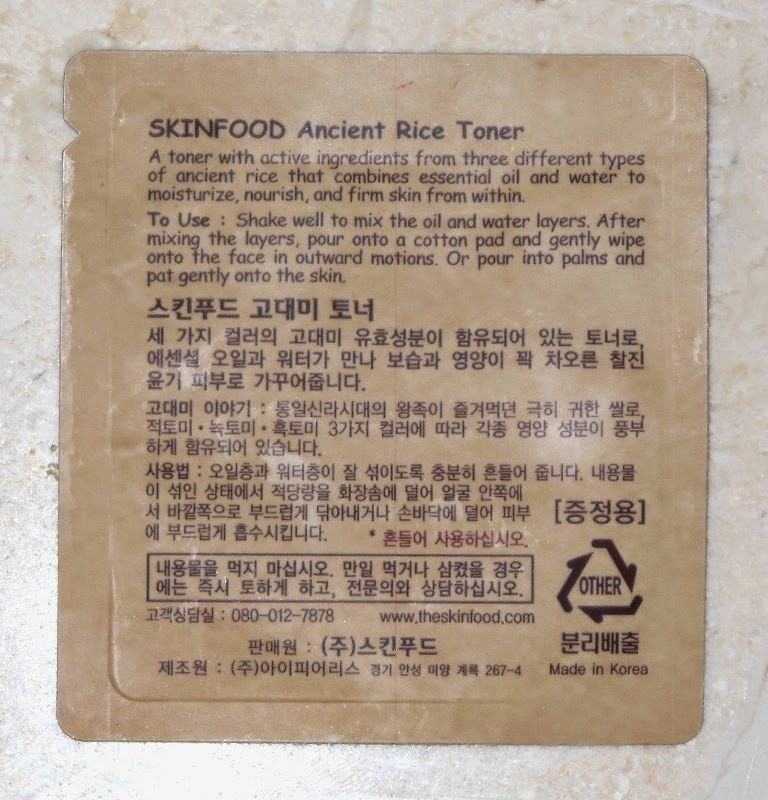 I picked up a 10 sample set of Skinfood's Ancient Rice Toner as part of a larger haul that included the Holika Holika Don't Worry Bee Care Calendula Toner (click here for review) as I continue the search for my HG toner and packets of 10 samples give me 5 days worth of product. I figure that's enough to categorize it as either "Worth getting a full size for testing", or "Eh, hard to say, going to add it to the 'maybe' list", or "SWEET MERCY NO. KILL IT WITH FIRE!" which is generally the categories that skincare falls into for me. 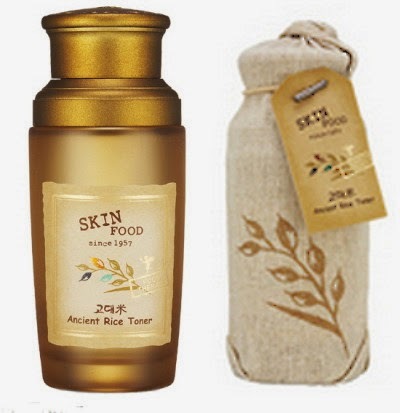 Purpose: The official Skinfood website describes it as a "toner with active ingredients from three different types of ancient rice that combines essential oils and water to moisturize, nourish, and firm skin from within." Can I just take a minute here and give props to Skinfood for not only having reasonably sensical English, but for also using an Oxford Comma? Whoever is doing your translations, give them a raise. I mean, not even native English speakers use it on a regular basis, and some are not even aware that it exists in the first place. It's a pretty advanced piece of punctuation for a non-native speaker to use. However, later you'll see another excerpt from their website that doesn't use it. Happy accident perhaps? I digress; let's get back to the review. Texture: Thin, and a mixture of water and oils. More on that later. Scent: Medium to heavy. Has a typical floral/herbal scent found in a lot of 'natural' style Korean products. It fades fairly quickly though, and stays close to the skin so unless you dab it under your nostrils, you should be fine. Quantity: Sample size, in a package of 10. Availability: I purchased the samples on ebay, and it looks like the full size is tricky to find; as of this post, koreadepart.com has it in stock. Price: My package of 10 was about $9, which is highway robbery considering how tiny the packets are and how little product is in them. (See action shots below) I see one seller on ebay has a 10 packet group for $4, which is still pricey for what you get. The full size on koreadepart is only $19 for 155ml! Bizarre. Full Size Purchase: No, but not because I didn't like it; it's just not what I am looking for in a toner. If I had dry skin, I would. The packaging of the full size version looks gorgeous though. Sadness. Disclaimer: I am looking for a toner that I can liberally apply to a cotton pad and swab over my face to confirm my cleanser has removed all makeup/bb cream, that will clear my pores and hopefully shrink them, and also help with healing and preventing acne. So I need it to be cheap, in a large size, and be more of a cleansing step than a hydrating step. 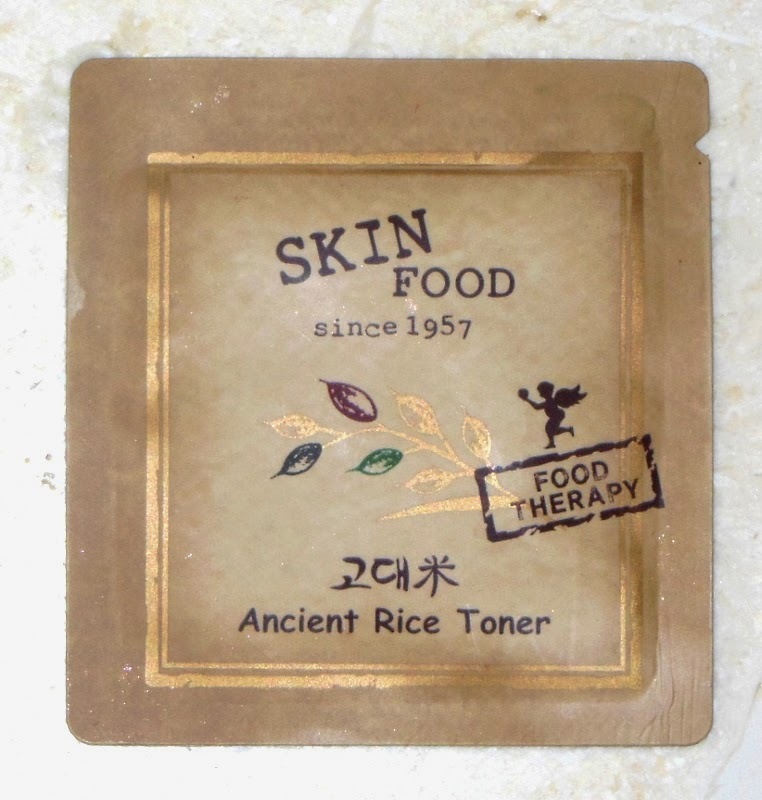 The Skinfood Ancient Rice Toner isn't it. Like many Asian 'toners', it's more of an ultra thin, fast-absorbing hydrating step before you begin to layer your emulsion/essence/serum/treatment/unicorn tears. You can read more about the differences between western and eastern toners in my skincare megapost (Part 1 click here, Part 2 click here). While it's not heavy, it's definitely rich and very moisturizing for a toner, almost more like a super thin emulsion. I already have several essence/serum/treatments that I am incorporating into my skincare routine and prefer to have my hydration added that way instead of via a toner, but if I had dry skin this would be a great product. The valuable red, green and black rice were served for the royal family of United Silla, an ancient kingdom of Korea. Depending on their color, the provide different nutrients that benefit your skin. -Red Rice: Enriched with polyphenols, a potent antioxidant. -Green Rice: Chlorophylls, a green plant pigment have superb anti-inflammatory properties. -Black Rice: Enriched with anthocyanins, a chemical that increases elasticity in skin, results in a dark color. Ironically, I absolutely loved how this toner felt when first using it, but halfway through my packets it occurred to me that I should read the directions *facepalm* and discovered that it's actually a mix of water and oil, and that you're supposed to shake it before use. Shake well to mix the oil and water layers. After mixing the layers, pour onto a cotton pad and gently wipe onto face in outward motions. 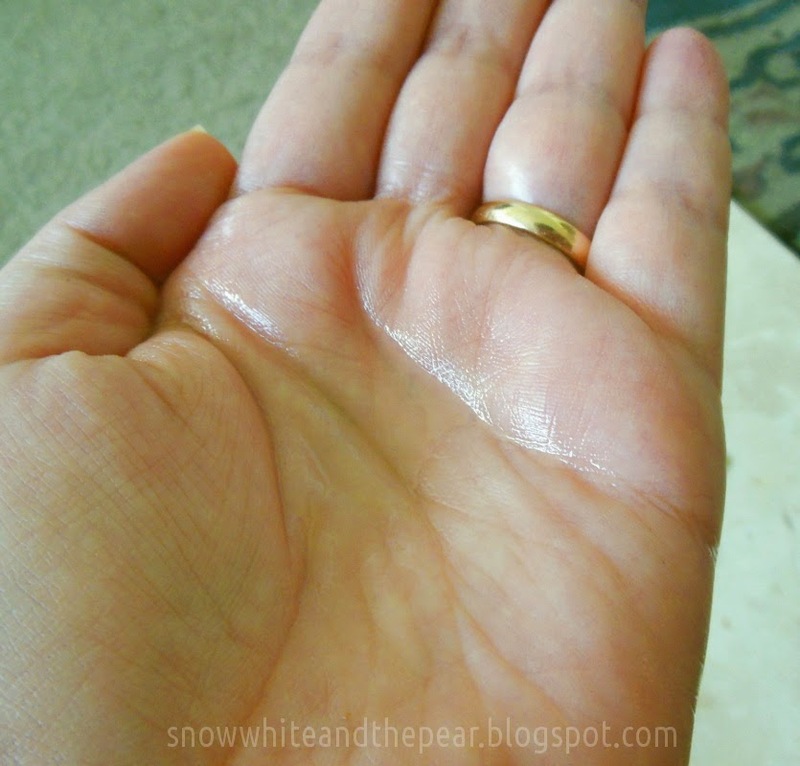 Or pour into palms and pat gently onto the skin. As soon as I mixed it properly, it was too rich for me and I no longer felt like I was getting much of a toner benefit-- as I mentioned above, it felt like a thin emulsion and it really wasn't what I needed. Also, there's no way there is enough product in these packets to use with a cotton pad; there wasn't really enough in them to spread evenly over my face so I would pour it into my palms, rub my hands together, and then pat a thin layer over my face. I would have to move quickly so the skin of my palms wouldn't absorb the tiny amount of product before I could get it onto my face, and when you think about the relative cost of these samples (10 for $9, + shipping) it's a bit ridiculous. Forget the cotton pad; it would barely be damp, let alone redistributing any of it onto your skin. I assume the directions are the same for the full size, where using a cotton pad would be possible. 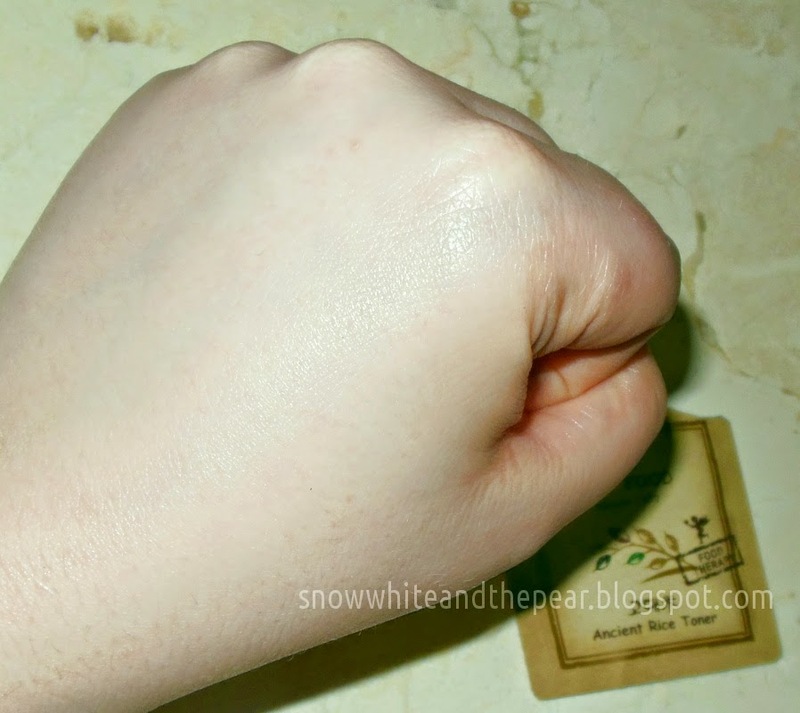 Still, with a rich toner that goes for $20 a bottle it feels wasteful to be losing so much of it on a cotton pad. It also leaves a faint luminous sheen to the skin, as if it has reflective particles in it. That sort of thing is pretty popular in Korean beauty products, so it's very possible it's in the ingredients list somewhere. It's not like the Twilight Sparkly Vampire levels you get with some Korean products, but if you're looking for a matte finish, you may need to powder a bit. I wish this product suited my needs so I could snag a full size bottle, especially if the bottle is glass. I'd find a way to reuse it, or maybe just store it on a shelf somewhere. I will say that this toner was very moisturizing and it did not break me out or make me particularly greasy relative to the moisture level. My hunt for the perfect toner continues. How do you deal with your sample hoard? Let me know in the comments below! *Disclaimer: All products I review are 100% purchased with my own money and my opinions are entirely my own. "For breakfast, I had eggs, toast and jam, a slice of melon, and orange juice." Do you see how the oxford comma allows me to infer there is a relationship between 'toast' and 'jam' (in this case, the jam was *on* the toast, it was not eaten separately) while still continuing to list other items as separate entities? "I like bananas, pears, red and green grapes, and oranges." If I didn't use the oxford comma, it would look like this: "I like bananas, red and green grapes and oranges" D: I mean, that's just all kinds of wrong. 'Red' is floating out there all alone, so what are you supposed to do with it? "I like bananas, red grapes, green grapes and oranges?" Ugh. UGH! Oxford comma all the way! According to the abovementioned oxford-comma-use-ranting professors, it's widely held as an academic standard in pretty much every country *other* than the US.